Invitation to the Twitter Party of the Year! 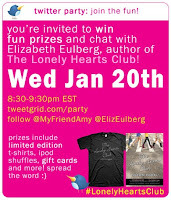 Anyone who tweets during this hour using #LonelyHeartsClub is entered to win alimited edition Lonely Hearts Club t-shirt! Watch for questions from @MyFriendAmy and win awesome prizes including aniPod shuffle, $50 iTunes gift card or $25 VISA gift card! To join the party, you can use our official party tweetgrid or just search#LonelyHeartsClub on Twitter. Sounds like this is going to be a blast.